If you go to the Code Pink website, it is full of lofty platitudes about peace and love and holding those evil conservatives ‘accountable’. There is plenty of hatred for American allies, including Israel and Saudi Arabia. There is also ample evidence for support of dictators world wide, including Maduro in Venezuela, and most shockingly, the murderous Mullahs in Iran. However, the website pales to the active support the group has recently given to the corrupt Iranian regime, which has harmed the Iranian people on a grand scale not seen since Stalin’s Russia and the genocide in Ukraine. The misery in Caracas is well documented; the misery in Iran is not reported by the Mainstream Media, who are still in Obama’s pocket and support his pro-regime agenda. 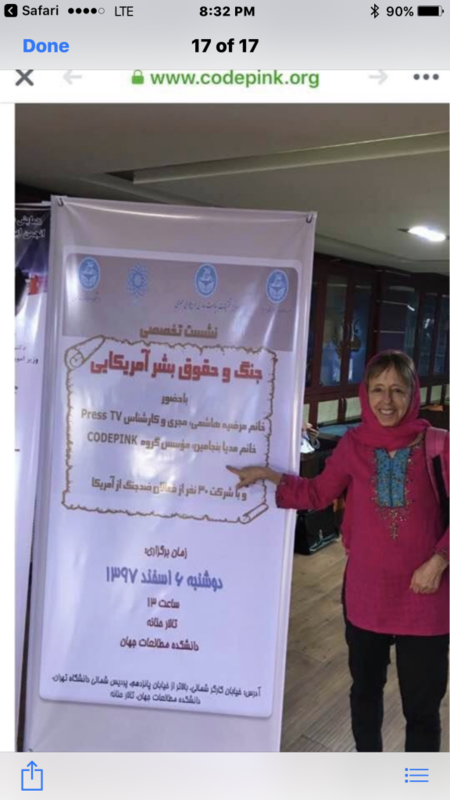 In early March of this year, a Code Pink delegation of thirty people traveled to Tehran to give the regime cover for recent scandals, including a severe water shortage across the country from corrupt mismanagement, and the continued arrest, detention, and execution of anyone opposed to the regime. In the capital city there were the usual anti-American news conferences,, speeches and photo ops, with plenty of anti-Trump rhetoric and denunciation of his decision to pull the United States out of the disastrous Iranian nuclear ‘deal’, the JCPOA. The group met with former Iranian Foreign Minister Javad Zarif and students at the FNA College of Journalism in Tehran. 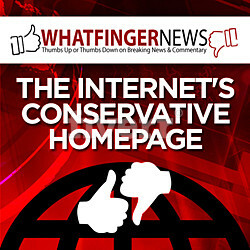 The Iranian government-run press declared after the meeting that [founder] Made Benjamin criticized Donald Trump for “ramping up confrontation with Iran”. The news conference was conducted by Fars News Agency, which is owned by the Iranian Revolutionary Guard Corps (IRGC), now designated a foreign terrorist organization by the Trump administration. So, Code Pink is giving material support to a terror group, one that has the blood of American troops on its hands. Also last Wednesday, the US anti-war activists participated in a press conference at Tehran’s Milad Tower where they criticized the US administration for abandoning the multilateral 2015 nuclear deal and re-imposing bans on Iran, saying such a move is the outcome of extensive lobbying by the Israeli and Saudi regimes, America’s staunchest allies in the Middle-East. Please tell me — what does this have to do with peace? Iran is continuing to develop its nuclear capability. The IRGC is developing ballistic missiles in violation of UN resolutions. The regime’s support of terror is greater than ever before with militia armies spread all the way to the Levant. Perhaps the ugliest truth about Code Pink is their willful disregard for the tens of thousands of anti-regime activists murdered over the last four decades, many of them women and young girls. The Mullahs even have a tactic of killing the young women arrested during a demonstration, then posting photos of the bodies in the local newspaper for the parents to identify and come pick up the remains. What is pink, or pro-women, about that? What is pro-peace about supporting a regime that has destroyed the economic lives of most of its population through corruption and simple theft? 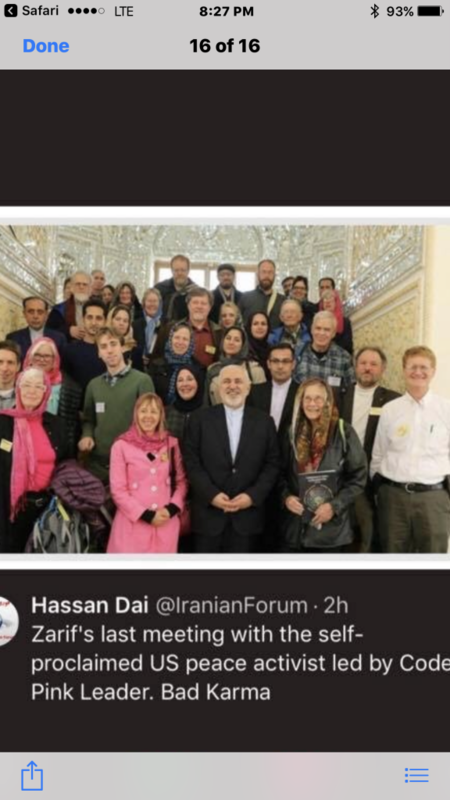 It seems what is rather happening is a group that is committed to Marxist totalitarianism and corruption, and the overthrow of the Western way of life, traveled to Tehran to consort with monsters. Someone should ask co-founder Medea Benjamin these questions. I bet she won’t answer them. Her hatred of anything pro-American or conservative is too visceral for her to face reality.